Realigning your internal framework a la Rolf! During the mid-point of my massage education, one of my professors described a technique known as Structural Integration. Falling under the alternative medicine umbrella, structural integration aims to put the body back into proper alignment by manipulating connective tissue (i.e. fascia) to release areas of restriction based on how the client has been moving and holding their body in space. This manipulation is done to affect the deepest level of the musculo-skeletal system (we are talking right down to the nerves) which might feel quite intense in the moment, but over time can reduce pain caused by improper movement patterns. In tandem with the work, the client is re-educated in how to move properly in order to maintain the results of the treatment. 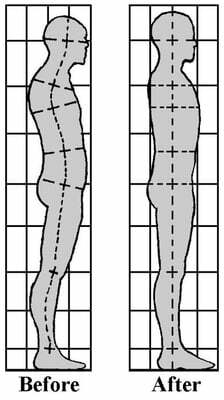 One of the most popular modalities of structural integration is Rolfing. I was familiarized with this when a close friend, who suffered traumatic injuries from an accident, received this bodywork along with her physical therapy. She went from being unable to walk all the way to full on modern dancing within a year. I recall her saying it hurt – A LOT. Intrigued, I did some research to see what it entailed. Created by biochemist Dr. Ida P. Rolf, who recognized that the body’s systems were all interconnected through a seamless network of connective tissues, it was originally meant for the chronically disabled to help improve their mobility. However, she soon learned that her method of postural release also applied to people with chronic pain, stress and/or who put intense physical demand on their bodies. Hmm…sounds like somebody familiar, e? Now that the benefits and technique have been laid out for you, there is the task of finding and working with the right Rolfer. A therapist cannot claim they Rolf unless they have been Certified by The Rolf Institute of Structural Integration, the only organization worldwide that educates and certifies Rolfers. You can search for and check a therapist’s credentials via the Institute’s website Verification link. Certification aside, a therapist’s approach can and will vary. It is important to find a practitioner that communicates effectively and listens to your feedback in a constructive manner. Another friend of mine received the technique and found that her therapist would not ask her questions or address her comments regarding the work. She left the experience feeling she was treated like a body, not a whole person. That is never a good thing in any form of bodywork and usually does not produce results. If you are open to being Rolfed, take the time to research your practitioner and/or get referrals from those who have been privy to this treatment. Dramatic change is priceless.